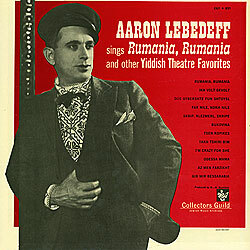 Aaron Lebedeff was a Yiddish theater super star whose popularity among Jews during the 1920s and 1930s made his name a household word. More than 80 years before performers could go viral on the internet, Lebedeff was making a name for himself by driving audiences wild with his energetic and exuberant live performances. He was a super-star, like Mick Jagger, who was able to excite audiences and leave them wanting more. His devil-may-care free spirit, love of life and allusions to sensual delights helped to create his exciting persona. Whether dressed in traditional Russian garb and boots or formal attire with straw hat and cane, his dynamic presence always kept him the center of attention. He understood nostalgia for the shtetl and was able use it to rouse his audiences’ emotions. His best known recording, Roumania, Roumania, was originally released in 1925. His second version, recorded with Sholem Secunda and Dave Tarras in 1941, became a best-selling Yiddish recording during the 1940s and still brings a smile to almost everyone who hears it! 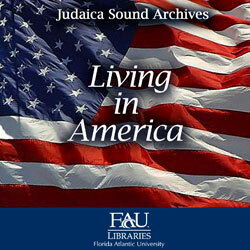 Because the JSA has received more copies of this recording than any other single 78 rpm disc, we regularly play it on our vintage 1924 Victrola for guests who visit us at FAU’s Wimberly Library in Boca Raton, FL. Hot Dogs and Knishes! is a comic ditty with a catchy chorus that even includes a barking dog. Hot dogs and knishes, romance and Coney Island ….. you can almost smell the nostalgia. 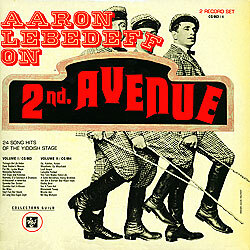 Lebedeff’s output of records was prolific. He recorded for Emerson, Brunswick, and Vocalion. Born in Homel, White Russia, in 1873, Lebedeff made his NYC debut in October 1920 at Thomashevsky’s National Theater, located at Seco nd Avenue and Houston Street on New York’s Lower East Side. He was an instant sensation! His success and popularity grew throughout the 1920s and 1930s. During the 1940s and into the 1950s his career continued to thrive though revivals. He continued to perform until his death in 1960. The Judaica Sound Archives has created this special Lebedeff online collection just for you! It contains three LPs produced by Collectors Guild and ten songs recorded on 78rpm which are in the public domain. Users of the Judaica Sound Archives Scholars Research Station have access to 186 songs on 78 rpm discs and 12 LP albums. 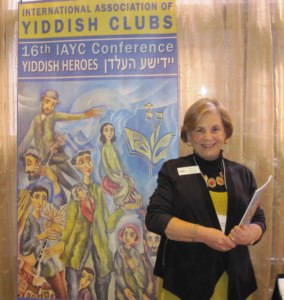 If you would like to donate your recordings by Aaron Lebedeff or any other Jewish performer to the JSA, please click here. Click here to listen to songs in the JSA online collection by Aaron Lebedeff.